'His arse is flapping!' Tyson Fury says Deontay Wilder is rattled after raucous weigh-in (PHOTOS) Get short URL Deontay Wilder donned a mask for Friday's official weigh-in ahead of his WBC world title fight with Tyson Fury, but he couldn't hide the fact that he was massively outweighed by the Brit. 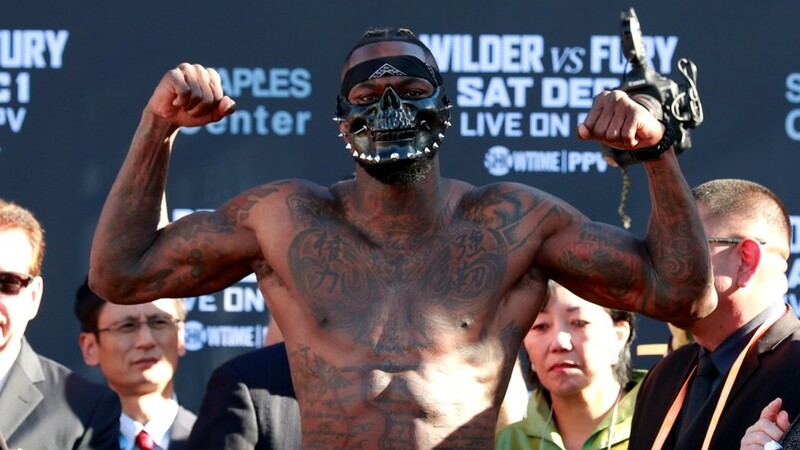 Wilder tipped the scales at a trim 212.5lbs at the weigh-ins, which took place outside the Staples Center, the venue for the fight on Saturday night in Los Angeles. 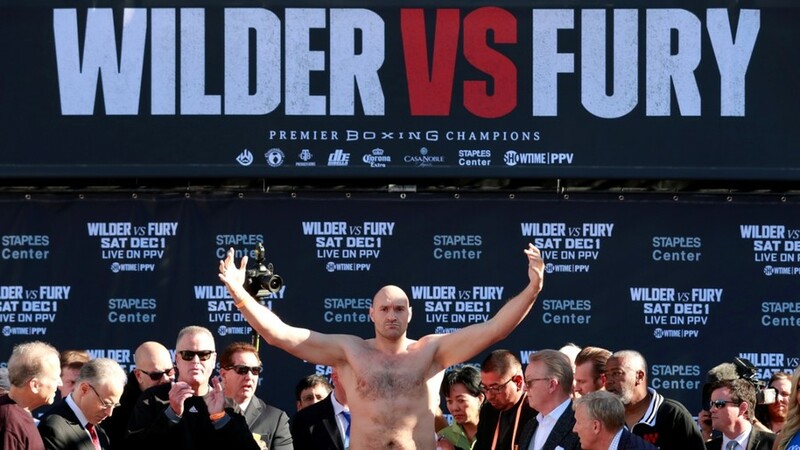 But Fury, coming into the contest in excellent shape, was considerably heavier than the defending champion. "The Gypsy King" arrived having shaved off his beard and weighed in at 256lbs. After both men had taken to the scale, they faced off for one final time ahead of their titanic world heavyweight title clash. But after the ugly scenes at the press conference earlier in the week, the face-off was conducted at long range, with the pair staring at each other from across the stage, with minders and security keeping the distance between the two fighters. Despite being the home fighter, Wilder was heckled and even booed by the crowd at the event. 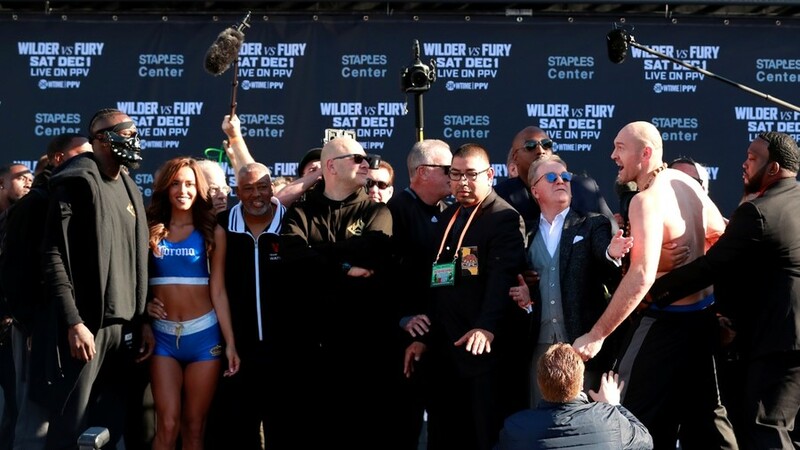 By contrast, Fury was cheered by a strong British contingent, who chanted and sang as their man stepped onto the stage to weigh in. "He's flapping! His arse is flapping!" Fury told BT Sport after the weigh-in. "He doesn't want to be in the fight and he is getting knocked out." Wilder, meanwhile, suggested that while Fury was the biggest fight of his career, it wouldn't be the toughest. "Talk is cheap, tomorrow is time. Actions speak louder than words, so come tomorrow I get to release everything that is inside of me. I cannot wait," he said. "It's definitely the most important (fight of my career) but definitely not the most difficult. My opponent last fight (Luis Ortiz) was way more difficult than him. "There will be one champion, one face, one name and he goes by the name of Deontay Wilder. "I am going to knock him out."